The very fate of the world was at stake. Bullets shot through the air faster than the eye could see. Bombs ignited explosions loud enough to pop your ear drums and powerful enough to kill scores of people in an instant. Planes flew close to the ground, leveling buildings like they were nothing. Battleships protected convoys of transport ships carrying vital equipment to support the various war efforts. Submarines tailed ships wherever the enemy could be found on the open seas. This was World War II, the war to end all wars. The various combatants required enormous amounts of ships and airplanes to fuel their war machines and huge numbers of these now lie at the bottom of the ocean. The Allies alone lost at least 1,900 warships between 1939 and 1945. The U.S. Merchant Marine, the fleet of ships carrying equipment on behalf of the U.S. Navy, had over 1,500 ships sunk due to the hostilities of war. The Japanese lost over 3000 ships totaling over 10 million tons. That is a lot of hardware! Divers, being the natural explorers that they are, have rediscovered and repurposed many of these lost vessels into dive sites. 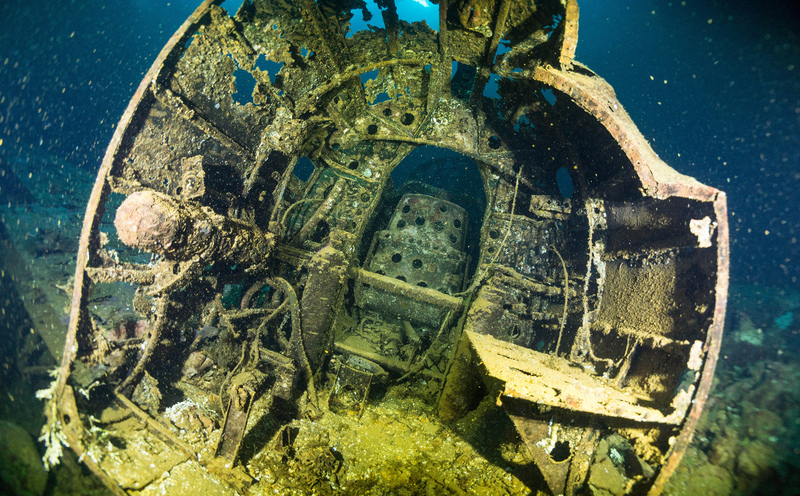 Every diver loves a good wreck, and every wreck has a history. Here we bring you a list of six wrecks downed during World War II, their histories, and what makes them great dive sites. The S.S. Thistlegorm was a British Merchant Navy transport ship sunk in October 1941 in the Red Sea. Built in 1940, it made three successful forays across the Atlantic before its fateful fourth voyage was cut short by the Luftwaffe (the German Air Force). Loaded with war equipment destined for the Allied armies fighting in Egypt, the Thistlegorm set sail for Alexandria and took the long way around from Glasgow, via Cape Town. After sailing around the whole of Africa and into the Red Sea, its passage through the Suez Canal was blocked by a ship collision. Instead, it anchored at Safe Anchorage F, where it was a sitting duck for two German Heinkel He-111 airplanes. Two bombs ripped a whole clean through the middle of the ship, setting off an explosion of ammunition and eventually leading to her demise. Nine crew members were killed in the attack. 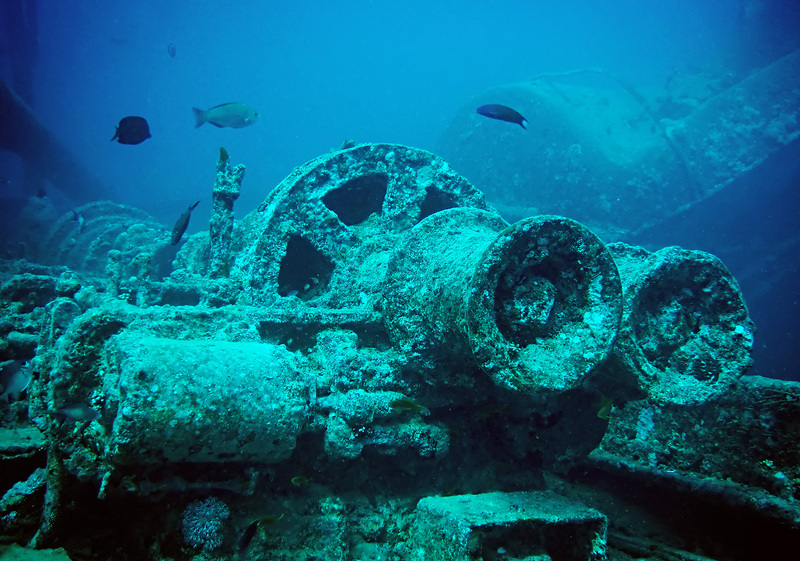 Today, the S.S. Thistlegorm is known as one of the world’s best wreck dive sites. The damage done by the German bombs have opened a significant section in the middle of the wreck, making penetration easy for certified wreck divers. The front half of the ship sits right-side-up in 30 meters (100 feet) of water at its deepest, comfortably resting on a bed of sand, while the stern leans on its port side. The Thistlegorm is an underwater war museum frozen in time. Both the 40-mm anti-aircraft machine gun and the 120-mm anti-aircraft gun located on the stern of the ship are intact. Its massive, open cargo hold is packed with war materials that never made it to its destination: armored vehicles, ammunitions cases, motorcycles, rifles and even a steam locomotive can all be seen in various cargo holds or on the deck. Common marine life spotted in the area include barracuda, sea turtles, stonefish, scorpionfish and batfish. 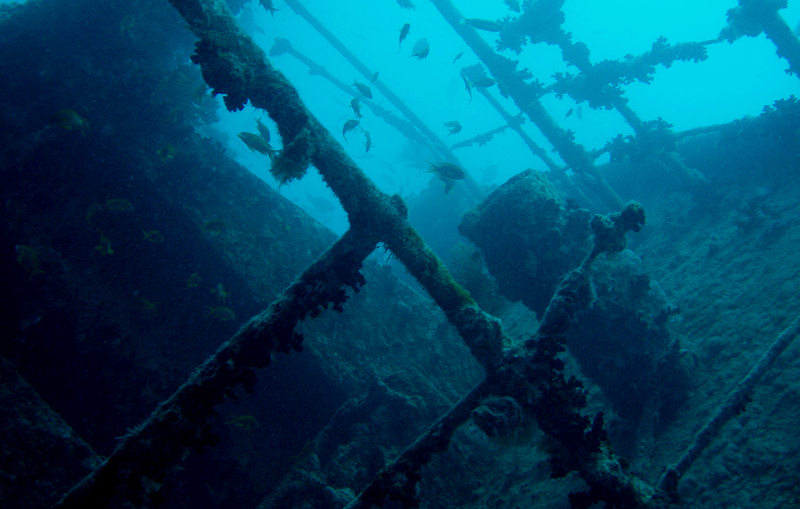 BONUS: Take a 3-D tour of the Thistlegorm wreck. The Chuuk Lagoon served as the Empire of Japan’s main base of operations in the South Pacific theater of war, the Japanese version of America’s Pearl Harbor. The Japanese presence on the islands of Micronesia was formidable, consisting of aircraft carriers, battleships, destroyers, cruisers, tankers, gunboats, submarines and more. The Fujikawa Maru and the San Francisco Maru were two of the hundreds of vessels stationed at Chuuk in February 1944, when the U.S. Navy launched Operation Hailstone, a massive air attack that crippled the Japanese fleet and earned Chuuk Lagoon the moniker ‘the biggest graveyard of ships in the world’. The Fujikawa Maru and the San Francisco Maru were both cargo ships that were at Chuuk undergoing repairs after suffering minor damage from attacks by U.S. aircraft. Both ships came under attack from U.S. bombers on February 17th, the first day of Operation Hailstone, and both were sunk the next day,. Given the abundance of sunken ships, Chuuk Lagoon is one of the best wreck diving locations in the world, and the Fujikawa Maru and San Francisco Maru are two of the most popular wreck dives in the area. 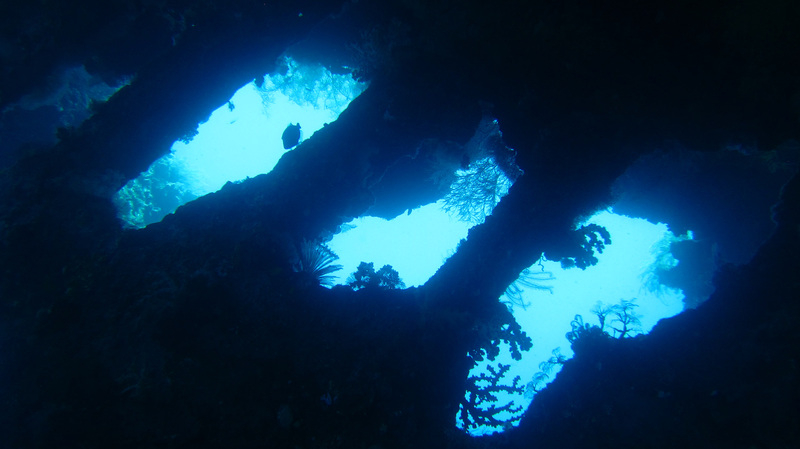 Fujikawa Maru is the more accessible of the two dive sites, with its deck in 18 meters (60 feet) of water and the bottom at 34 meters (112 feet). It is covered in an abundance of soft and hard corals which attract a diverse array of marine life, and divers are also attracted by the four disassembled aircraft located in one of the cargo holds. The San Francisco Maru is located much deeper, sitting in the sand with its deepest point around 62 meters (205 feet). Although this is beyond the recommended depth limit for recreational divers, local dive shops will take groups of divers to shallower parts of the wreck for very short bottom times along with short deco stops. They carry extra air and place staging tanks at various points throughout the dive in case of emergencies. For trained tech divers, it is a great tech dive with lots to explore and makes for a great training technical dive as well. The German submarine U-85 was the first U-boat sunk during Operation Drumbeat, Nazi Germany’s attempt to bring the war to the doorstep of North America by threatening the continent’s eastern seaboard. At a total length of 66 meters (2178 feet) the U-85 could operate as deep as 230 meters (750 feet) and was equipped with five torpedo tubes, one naval gun and an anti-aircraft gun. It had successfully attacked and sunk three allied ships on previous patrols when it was spotted on the surface of the sea just off Bodie Island on the Outer Banks of North Carolina. The U.S. destroyer USS Roper picked up a signal on its radar and headed to confront the U-85, which shot a torpedo at Roper as it approached. The torpedo missed, granting Roper the opportunity to let loose a barrage of machine gun fire that tore holes in its enemy’s outer hull. Roper also scored a hit with a 3”/50 caliber gun before sealing the deal by dropping depth charges that blasted the submarine as it disappeared below the surface. The U-85 now lays in its watery grave, leaning on its starboard side, in a depth of 30 meters (100 feet) with its conning tower, the raised platform from which an officer directs the vessel, accessible at 24 meters (80 feet). 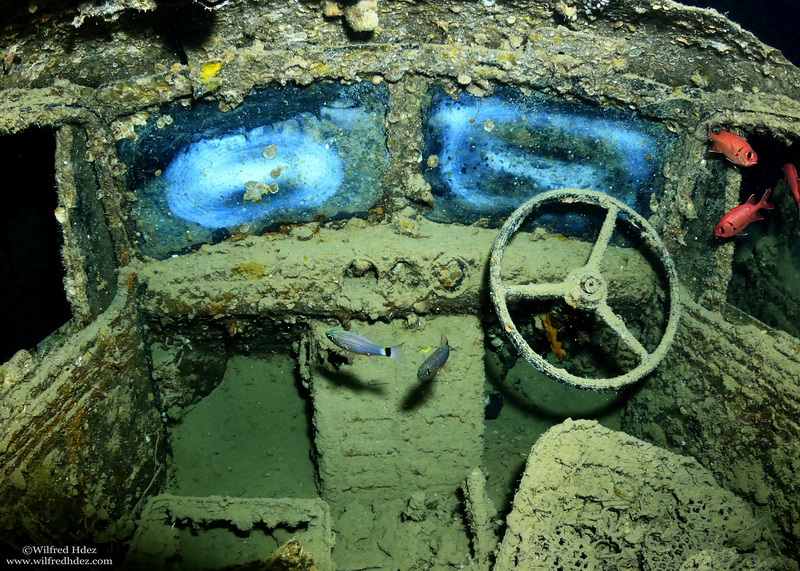 The outside of the U-boat has been colonized by soft corals and algae. The deck gun, presumably taken out to engage the USS Roper in its final battle, is intact and pointing upwards. The U-85 is considered an advanced dive because its location on the outside corner of the Outer Banks exposes it to waters of the Labrador Current making strong currents a common factor on dives. Also, the average water temperature is low, so a full wetsuit is highly recommended. The Labrador Current is also known for bringing in thick, green waters that limit visibility to around 30 feet on a good day. BONUS: Check out this photomosaic of the U-85 created by the National Oceanic and Atmospheric Association. By far one of the most popular World War II wrecks is the USAT Liberty just off the coast of the tropical island of Bali. The USAT Liberty was a U.S. Army transport ship taking part in the Allied war effort in the Pacific. In January 1942, it was transporting rubber and railway parts from Australia to the Philippines when it was attacked by a Japanese submarine, the I-66, inside the Lombok Strait. A direct hit from a torpedo tore a sizeable hole in the ship’s hull, putting it out of commission. Two Allied destroyers came to the Liberty’s rescue, chasing off the Japanese submarine, and towing the Liberty to a nearby port. The USAT Liberty on the open seas. Unfortunately, the Liberty would never make it to port. It was taking on too much water so the destroyers ran it ashore at a nearby beach, where it sat for over 20 years. 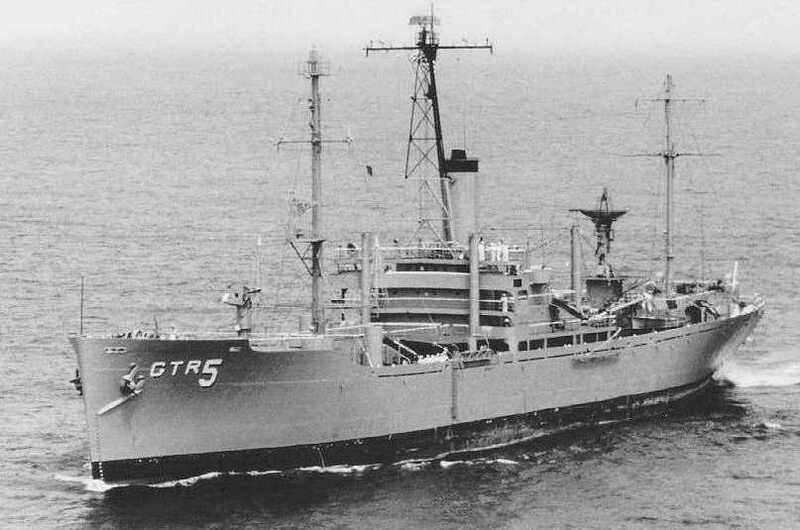 The USAT Liberty would have never been made into a dive-able wreck if it were not for the eruption of Mount Agung, an active volcano, in February 1963. Tremors linked to the eruption caused Liberty to slip off its beachside perch and slide down a sandy slope until it was completely submerged on a sandy slope, where it remains today. 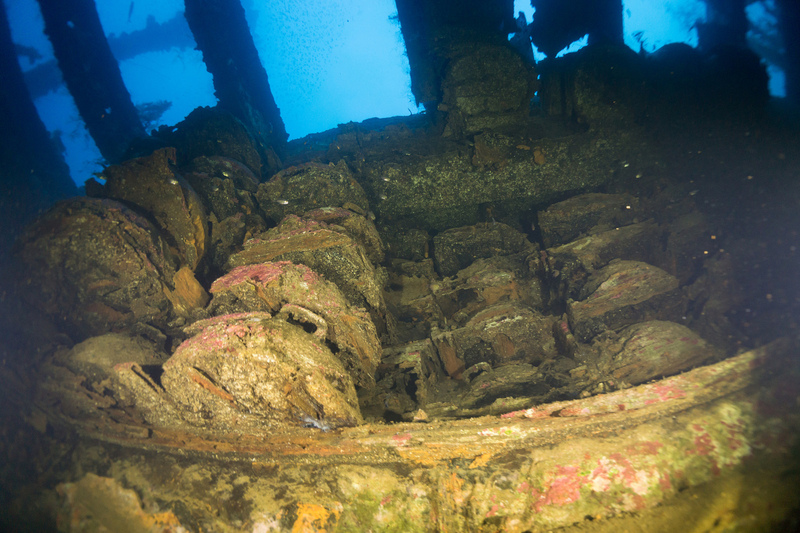 The wreck of the USAT Liberty has become one of the most accessible wreck dives in the world. Due to its proximity to the beach and shallow depth—the shallowest part is at 5 meters (13 feet) while the deepest is around 28 meters (91 feet)—it is an easy shore dive. Lying parallel to the shore, the shallow end of the wreck is accessible to both snorkelers and open water divers, while advanced divers can start at the deepest end and make their way up through the dive. The wreck is a big one at 120 meters (393 feet), enough to keep divers busy over multiple dives. Numerous holes throughout the structure of the ship provide plenty of opportunity for exploration, with many swim-through locations. On most days, the Liberty wreck is teeming with marine life as it has developed into a healthy reef system. Much of the exterior and interior is now encrusted in hard and soft corals, attracting a variety of fish and macro creatures. Divers can expect to be greeted upon arrival at the wreck by surgeonfish, napoleon wrasse and bumphead parrotfish. Barracudas, trevallies and fusiliers are also commonly spotted milling about. The wreck itself is also home to many kinds of smaller reef fish and colorful nudibranchs. 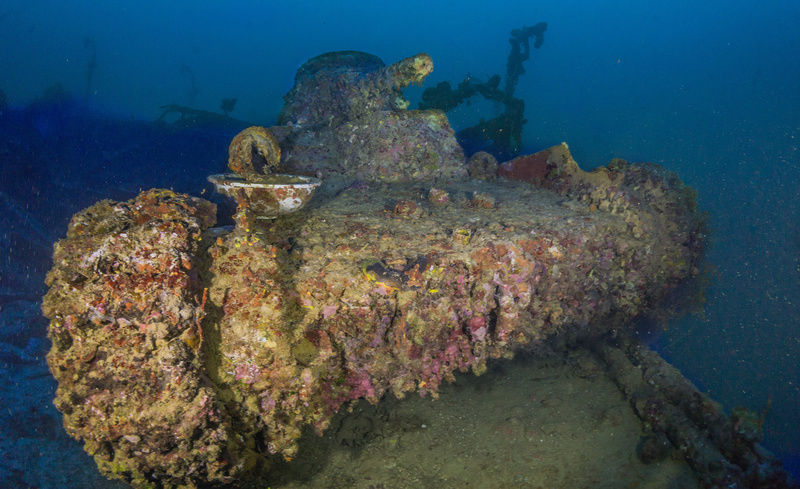 BONUS: Read our article More Than Just a Dive Site: the USAT Liberty Wreck. The idyllic Coron Bay, north of the Filipino island of Palawan, became a hiding place for a group of Imperial Japanese Navy ships that retreated there after being attacked by U.S. forces in Manila Bay in September 1944. Despite the bay’s sheltered waters, they were no match for the striking power of U.S. Task Force 38, which struck in the early morning hours of September 24th, 1944. The 24 Helldiver bombers and 96 Hellcat fighters involved in the attack had less than 30 minutes to sink as many ships as possible before their fuel would run too low for them to complete the long journey back to their aircraft carrier. The attack was short but effective. In total, about 15 of the 18 Japanese ships in the area were sunk or severely damaged. The American fighter planes did exactly what they were supposed to: rain down hell on the Japanese supply ships. The Akitsushima was a 118-meter (387 feet) long seaplane tender, an armed ship designed to carry and repair seaplanes. Having survived the devastating U.S. attack at Chuuk Lagoon, its luck ran out at Coron Bay. A direct hit from a torpedo dropped by a U.S. torpedo bomber struck its fuel tanks, blowing the ship wide open and sealing its fate. Divers can now find this massive wreck lying on its port side at 35 meters (11 feet). The crane that was used to lift the seaplanes on and off the ship has detached from the body of the ship and lies sideways across the sand. It is a good place to start the dive. The deck is outfitted with several anti-aircraft guns which remain intact. The bridge section has mostly collapsed but the impressive radio tower is largely undamaged. There are many places to penetrate this wreck, including through a hole in the hull that brings you into the machine room that operated the crane. Wreck divers can also enter the engine room and control room, and explore the connecting corridors and three deck levels. The ship does not contain many corals but still manages to attract marine life, including barracudas, batfish, scorpionfish and more. The Akitsushima is considered an advanced dive because of occasionally strong currents that reduce visibility below 15 meters (49 feet). 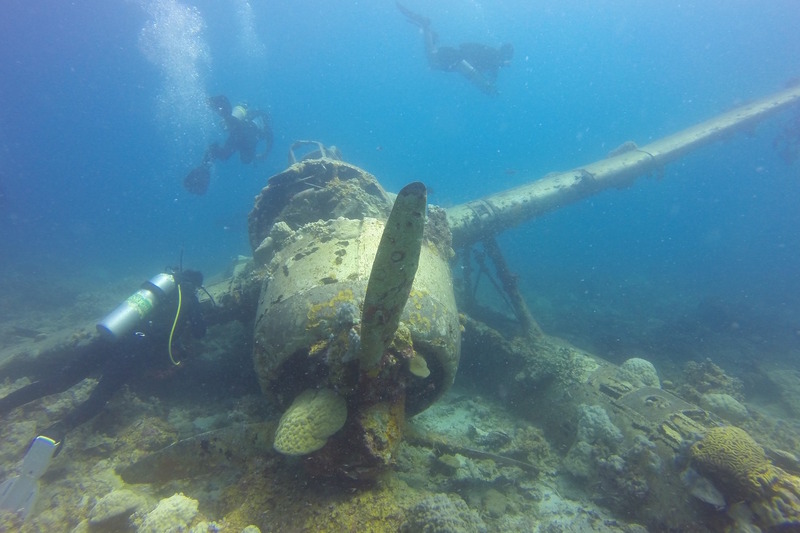 If you want a different kind of wreck experience, why not dive an airplane wreck? The wreck of this Aichi E13A-1 Japanese Navy Seaplane, nicknamed ‘Jake’ by the Americans, served as a slow-moving Japanese reconnaissance airplane during World War II. This plane had its base nearby at Meyuns, the second-most populous city in the tiny Pacific island nation of Palau. 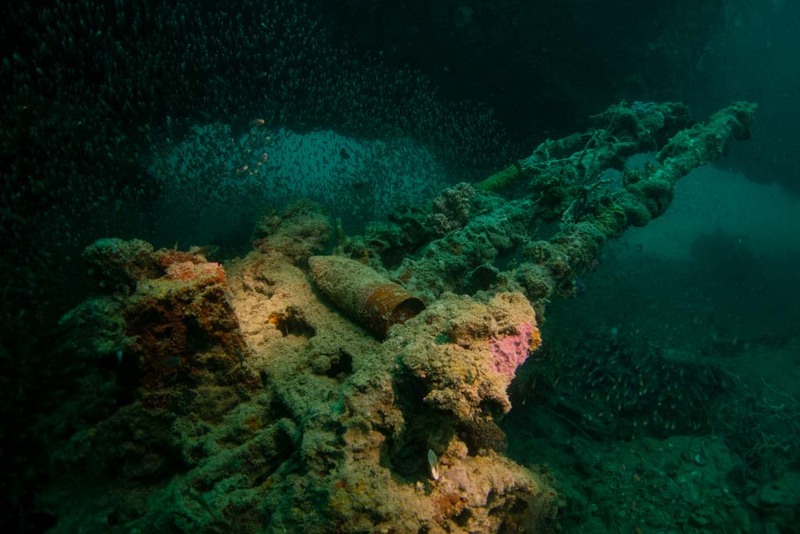 In 1944, as the U.S. wreaked havoc on Japanese military outposts throughout the Pacific, Palau became the site of some massive battles, which most likely resulted in the sinking of this seaplane. The plane sits in 13 meters (45 feet) of water with its wings, one pontoon and cockpit intact. With a length of 11 meters (36 feet) and a wingspan of 15 meters (49 feet), it is a decent-sized aircraft. The propeller has broken off and lies directly in front of the body. The other parts that have broken off, including the engine, the second pontoon and the tail, can be found a short distance away. The entire plane has been overgrown with surrounding coral. The Jake Seaplane is an amazing dive site and a unique wreck dive that most divers do not get to experience. The warm and pristine waters of Palau, and the shallow depth of 13 meters, make this an extremely easy dive for any type of diver.